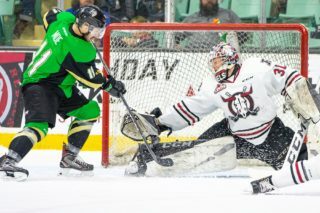 Based on the manner in which he carried himself Monday afternoon at the Red Deer Servus Arena, Oleg Zaytsev was true to his word when he later described his style of play. “Basically I am a very physical player. 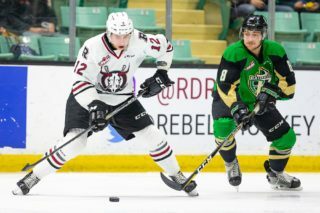 I like to win battles and I have a pass and I can score,” the incoming Red Deer Rebels forward said following Russia’s 7-2 win over Finland in an under-18 Hlinka Gretzky Cup game. Clearly, Zaytsev is not immune to self criticism. Despite scoring a power-play goal and showing a cantankerous side, the six-foot-one, 185-pound Russian centre — selected 17th overall by the Rebels in June’s CHL import draft — insisted he can be better than was the case Monday. “I am pretty happy with our team performance basically because we won 7-2, but I cannot say that I am happy with my own performance,” the 17-year-old said through a translator. 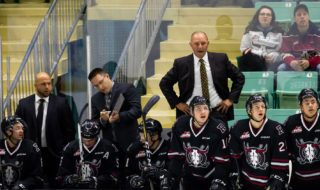 Rebels GM/head coach Brent Sutter attended Monday’s contest and also took in the Russia-Switzerland pre-tournament game Saturday at Lacombe. He’s confident Zaytsev will be a force in the Western Hockey League. “He’s smart, just a real skilled, good hockey player,” said Sutter. “He knows how to play the game and he’s a really good skater with great hands. In the same vein as the Russian team has clearly adapted well to the smaller ice surfaces — as opposed to those in Russia — in Lacombe and Red Deer, Zaytsev doesn’t see himself struggling while conforming to the style of play in the WHL. “As a team I think that we adapt pretty well to the smaller ice rinks. It looks like there is no difference right now,” said the Moscow native. Zaytsev is projected as a first-round pick in the 2019 NHL entry draft and will be in the sights of pro scouts while playing with the Rebels during the upcoming season. “This is a very new experience to me and I want to test myself in North American hockey,” he said. Zaytsev and his Russian teammates encountered few hurdles while cruising past a Finnish team that reportedly is without some of the country’s top U18 players. Arsen Gritsyuk scored twice for the winners, who pelted Finnish netminder Roope Taponen with 60 shots. Nikita Vashchenko, Danill Gushchin, Vasili Podkolzin and Ilya Mironov also tallied for Russia, while the Finland goals were provided by Patrik Puistola and Aarne Intonen. Russia goaltender Vladimir Sartakov made 24 saves. In the evening contest, Robert Mastrosimone tallied twice and Dustin Wolf stopped all 23 shots he faced as the United States blanked the Czech Republic 6-0. 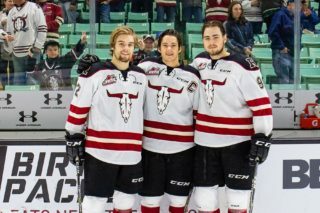 Also scoring for the winners were Jackson Jutting, Aaron Huglen, Grant Silianoff, who also chipped in with three assists, and Luke Toporowski. Czech Republic starting netminder Nick Malik made 21 saves before being replaced by Jan Skorpik, who stopped 13 shots. At Edmonton, Canada crushed Switzerland 10-0 Monday night, getting two goals from Peyton Krebs and a 15-save, shutout performance from Nolan Maier. 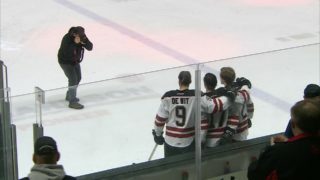 Ryan Suzuki, who added two assists, Graeme Clark, Jakob Pelletier, Dylan Cozens, Xavier Parent, Matthew Robertson, Maxence Guenette and Kirby Dach, who contributed two helpers, also scored. Swiss netminders Sascha Ruppelt and Thibault Fatton combined to make 38 saves. In the afternoon game, Karl Henriksson and Philip Broberg, with his second of the contest, scored third-period goals for Sweden in a 4-2 victory over Slovakia. Albin Grewe had the other Sweden goal. Vladimir Sartakov and Oliver Turan scored for the Slovaks, who got a 40-save performance from Patrik Kozel. Jesper Wallstedt blocked 19 shots for the Swedes. Russia will take on the Czech Republic at 3 p.m. Tuesday at the Servus Arena and the United States and Finland will do battle in the other Pool B game at 7 p.m. In the provincial capital, Sweden will play Switzerland and Canada will face Slovakia in Pool A contests. The final preliminary games will be played Wednesday, with the Czechs and Finns facing off at 3 p.m. and the Americans and Russians clashing at 7 p.m. at the Servus Arena, and Edmonton’s Rogers Place playing host to Switzerland vs. Slovakia and Canada vs. Sweden. The semifinals, set for Friday, and Saturday’s bronze and gold medals games will be played at Rogers Place.